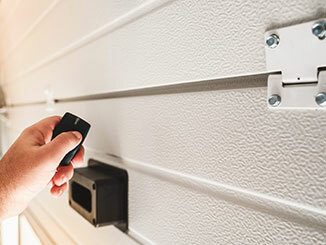 Getting stuck in your driveway unable to get your garage door opener to work the mechanism is an ordeal no homeowner wants to go through, especially when in a hurry or in bad weather. If this has happened to you, you have probably tried pressing the remote button multiple times to no avail. In most cases, assuming you've tried changing batteries, a simple resetting of your remote is all it takes to get your door up and running again. Here's what the process entails. Depending on your garage door opener model, the way in which you will reprogram a current remote can vary slightly. Still, most openers allow you to easily access the control panel - usually located on the device itself or reachable by removing the cover. From there, you will need to find a red button, typically named 'learn' or 'settings'. Before pressing and releasing that button, make sure your remote is near you. Then, when the light is blinking on the opener, press the button on the remote and the light will start blinking. Voilà, your remote is programmed and connected to the opener. Sometimes, for example, if you lost your remote or it broke, you'll need to set up a new one. This requires erasing all codes from the opener so that you can work the mechanism via the new remote. Maybe a power outage or a similar issue prompted the opener to automatically delete the codes and left you wondering how in the world are you supposed to set up a new remote. Again, the process won't be exactly the same for Chamberlain and LiftMaster units but it won't be very different either. You'll need to locate and press the red button and wait until the flashing light stops blinking. From there, repeat the previous steps and reprogram the remote(s) of choice. If your opener still doesn't react to the remote, maybe you're facing a more complicated issue with the device itself. In this case, your best bet is calling our team of experts at Garage Door Repair Danville to have your issue addressed as soon as possible. With our local garage door repair services, you will always get a fast solution for any problem you may have. In addition to repairing hardware parts like springs, tracks, and panels, we also install automatic openers as well as new doors. If you need help with anything, we're the right team to call. Use our online system to schedule an appointment with the click of a mouse. Our technician will contact you before arriving. Until then, feel free to browse our website! Garage Door Repair Danville is at your service!